It’s about that time of year again, the time where you begin scrambling all over town searching for THE perfect holiday gifts. 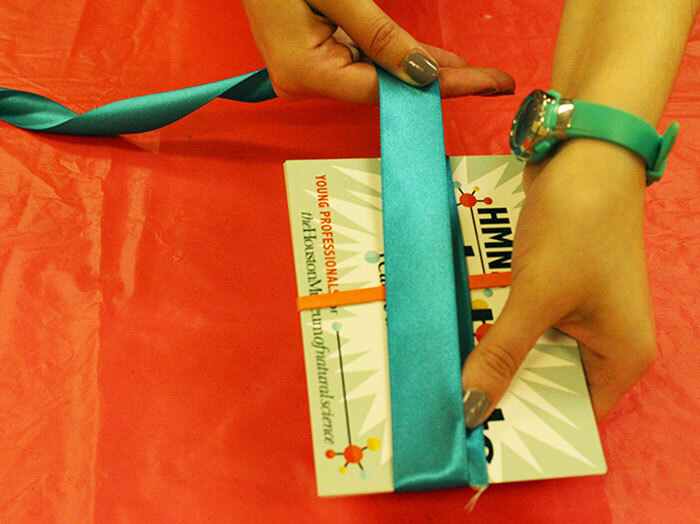 Don’t fret, let HMNS help you out this year on gift hunting. We invite Members to join us for an evening of drinks, crafts and of course, shopping on November 2 at 6 p.m. If you’re like us, shopping for holiday gifts can get a bit out of hand. You either run out of time, or finding something for everyone on your list might prove to be more difficult than expected. Online shopping is always an option, but sometimes waiting for those items to arrive on time can start a panic. Don’t panic! Instead, stop by HMNS and you might even find a gift for that cousin you can never find anything for. As an added bonus, Members will receive a 25% discount- regardless of Membership Level! After you’ve browsed the gift shop, and have made your selections, feel free to use our gift bags and have your gifts ready to stash under the tree. Do you want something more festive? Our crafts will focus on embellishing that plain gift bag or even help inspire you for when you’re giftwrapping at home. These would even just make a nice holiday ornament to adorn any wreath, tree or table setting. Get creative and have fun! Mark your calendars for HMNS’ Sip and Shop! 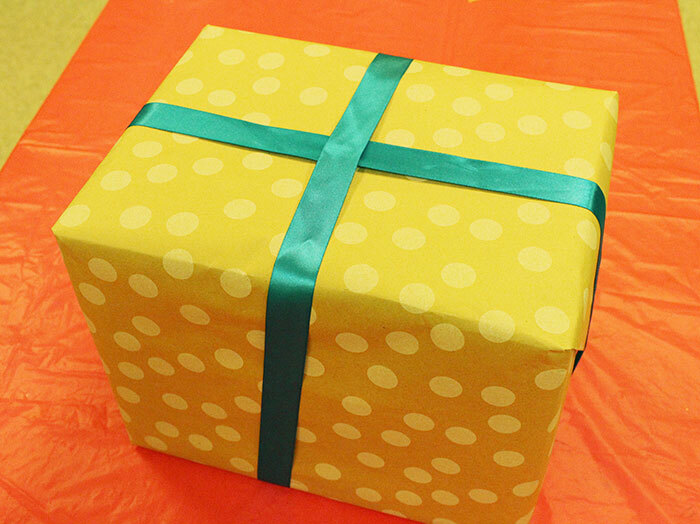 Start by measuring out some ribbon for the size of the gift. This is an optional and can be skipped if you only have a certain amount of ribbon left. 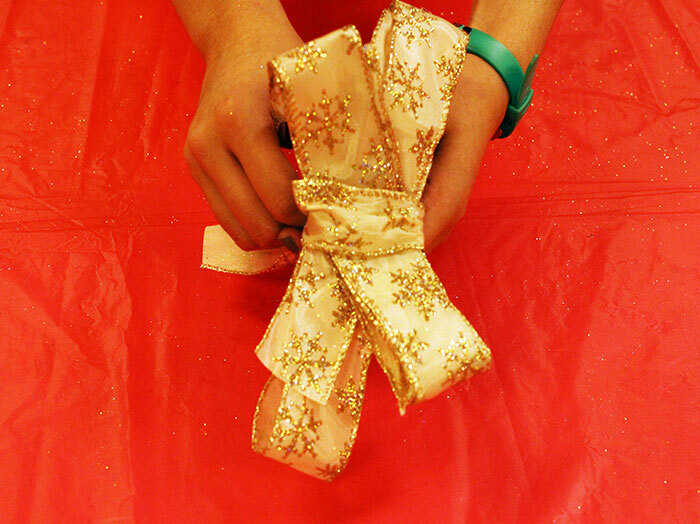 Typically, you would want to leave tails so you could tie the bow to box, if you do not have enough ribbon, you can always use double sided tape. 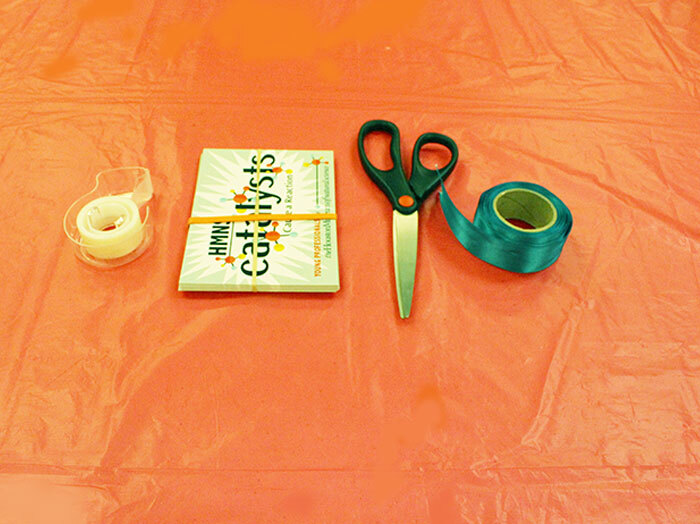 Begin by wrapping the ribbon around your stack of cards/notebook. This will determine how big your bow loops will be. Wrap around 5 times or more. The more ribbon you use, the fluffier your bow will be but keep in mind that you will repeat this a second time, except you will wrap around 7 or more times. 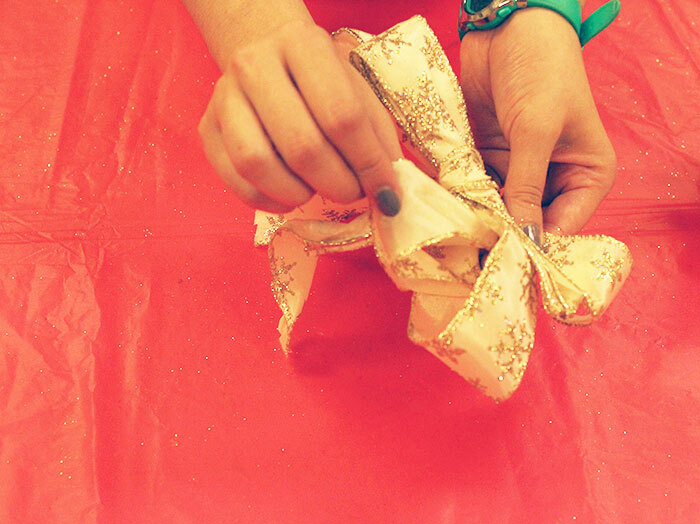 Feel free to use different color ribbons for contrasting bows. 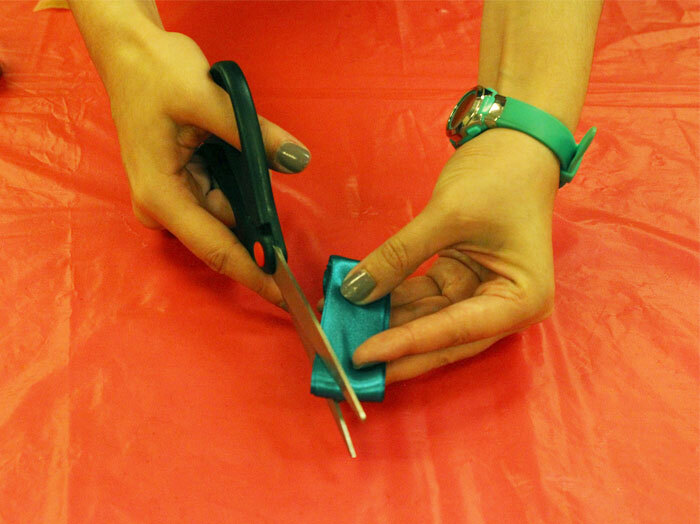 After cutting, remove ribbon from cards and fold in half. On the folded area, cut of corners. Repeat with second round. If you are using a wired ribbon, skip this step. Crisscross ribbon rounds and tie together using the extra tails of ribbon or a contrasting ribbon. Wire could also be used if attaching to a wreath. Pull loops, slowly, to center- alternating between sides. 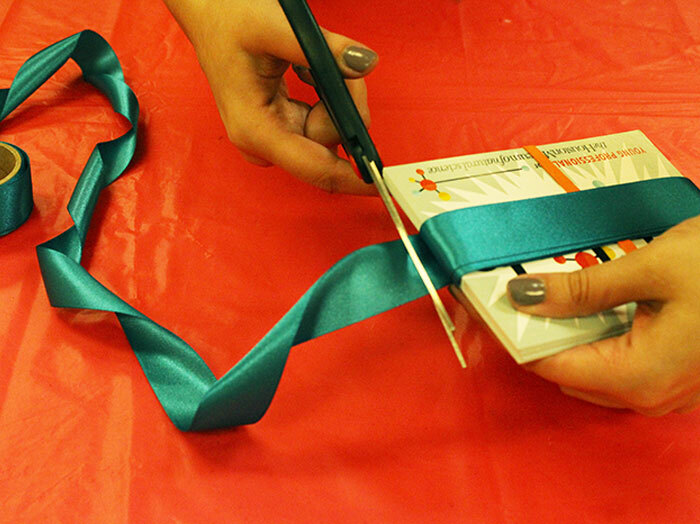 Wired ribbons are easier to manipulate, so we recommend using a wired ribbon if you’re a beginner. 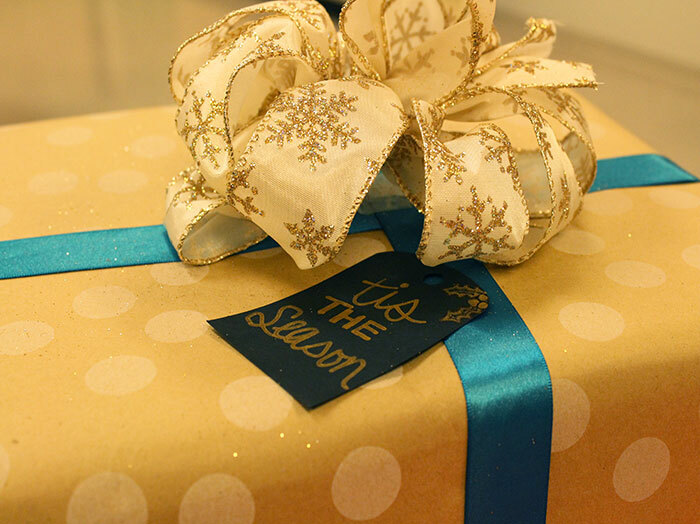 Top your gift with the bow and gift tag and TA DA! You’re done! 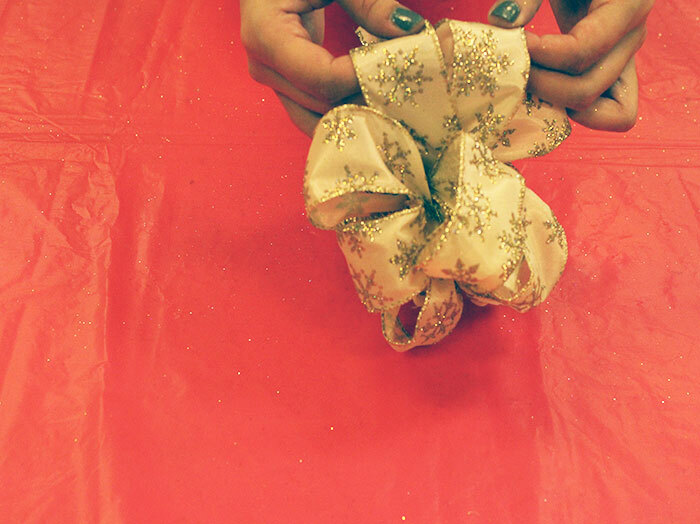 We’ll have tons of fun crafts and tutorials to help you up your giftwrapping game this season. We hope to see you there for the Sip and Shop on November 2!